The six training plans contained within this packet details 42 weeks (approx 9.5 months) of training in preparation for attending the Army Ranger School. It is intended that you begin the programming in this packet 42 weeks directly before you report for Ranger School. This packet is organized so that each plan will build your fitness for the next. The purpose is to build sufficient fitness to complete Ranger School regardless of your initial fitness level. You’ll begin with the MTI Military On-Ramp Training Plan which will introduce you to the intensity and scope of MTI programming and lay the base for the following programming. The next four plans in the packet, Humility, Fortitude, Valor and Gratitude come from our Virtue Series of training plans which were originally deployed as day-to-day fitness for SOF and have since evolved and been updated to represent the latest elements of MTI’s programming approach for military athletes. These four training plans are potent tools which work progressively together to build your physical and mental fitness, durability and resiliency moving toward Ranger School. 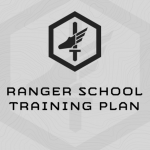 Directly before Ranger School, you’ll complete the MTI Ranger School Training Plan which is laser-focused on preparing you to pass the gates during RAP week, including the Ranger PFT and 12-mile ruck, and build your endurance/stamina for the months at Ranger School that follow. The six plans, in the order you’ll complete them are listed below. (1) Military On-Ramp – Bodyweight Strength, Gym-Based Strength, sprint interval work capacity, ruck runs with increasing weight and unloaded running intervals. The place to start with MTI Programming for Military Athletes. 5 day/week training plan. (2) Humility – Limited Equipment Training Plan with slight endurance emphasis. Bodyweight strength endurance and dumbbell strength progression. Loaded (25# or IBA) running and unloaded running. Chassis Integrity work. Humility has a “hardening” effect on athletes who complete it. 5 day/week training plan. (3) Fortitude – Heavy gym-based strength, unloaded running and ruck running. Unloaded running and rucking intervals, gym-based Strength, Work Capacity, and Chassis Integrity. 5 day/week training plan. (4) Valor– Work capacity and speed over ground focused training plan which continues gym-based strength work and Chassis Integrity Development. 5 day/week training plan. (5) Gratitude – Strong endurance and stamina emphasis. Heavy, barbell-focused strength work. Endurance deploys gym-based endurance, unloaded running, and ruck running. Bumps up to 6 days/week. 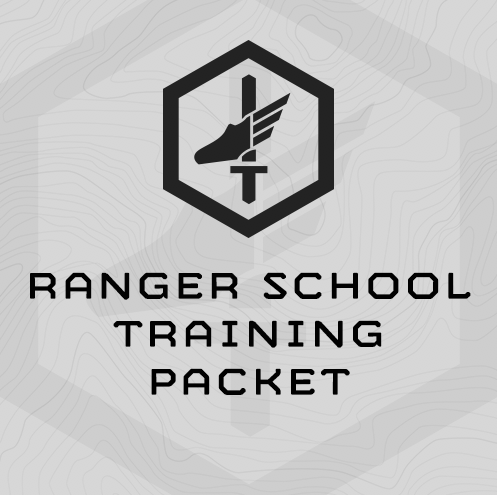 (6) Ranger School Training Plan – Specific training for Ranger School PFT, Running, Rucking, and Work Capacity. It’s very important you complete the final, Ranger School Training Plan the 8 weeks directly before you report for reporting. This plan includes a taper, so there’s no need to take rest week after it’s completion. The price for this packet of plans, $209, represents a 30% savings over the combined price of the individual plans. Click the individual training plan links below to find the specific equipment requirements for each training plan. In general, Humility and the final Ranger School Training Plan are limited equipment training plans. Fortitude, Valor and Gratitude require a fully-equipped functional fitness gym: Fully Equipped Functional Fitness Gym including barbells, racks, bumper plates, sandbags (40# for women, 60# for men), Dumbbells and/or kettlebells, plyo boxes, etc. All the training plans include rucking, so you’ll need a ruck and up to 65# of filler/load. Other equipment includes a stop watch and foam roller. Option is a gps watch for measuring running and rucking distance. Military athletes attending Ranger School in the next 6-12 months. What if I don’t have 42 weeks before attending Ranger School? It’s important you begin this programming with the Military On-Ramp Training Plan and finish with the Ranger School Training Plan directly before Ranger School – this is 14 weeks of training. Fill in the time you have between with first Humility, then Fortitude, then Valor, etc. We can help with specific guidance and planning. Please email coach@mtntactical.com. How long will I have access to these training plans. Forever, or as long as MTI is in business, whichever comes first. You will also get access to any updates we make to the training plans. To see/experience the first week of programming for each of these training plans click on the individual training plans above, and then click the “Sample Training” tab to see the entire first week of programming. I don’t want the entire packet of plans. Can I purchase the plans individually? Yes. Click the plan links above to purchase individually. • Ruck for rucking and ruck running. I actually went to school…) and I went straight through the course without issue. The mountain phase in particular was not even close to as bad for me as it was for 90% of the other dudes out there and I have to credit your program for really helping me get my legs ready for the exceptional challenges. I really do believe that I had the endurance to go the distance… And even as I was losing pounds of body mass and muscle each week, I had the foundation and confidence to know that I could take the next step and keep moving. Just wanted to give you guys some feedback. I just completed Ranger school. I used the Ranger train up program twice prior to my original start date, then got delayed a month since the january class was overbooked and followed your operator pentathalon program. There wasn’t a single day my legs felt the hurt that some other guys were feeling. I even volunteered to carry the heavier equipment on multiple long walks and the hike up Mount Hawk. I just graduated Ranger School and was able to make it through without any recycles. A large part of that I think is due to my training leading up to Rangerusing your Ranger School prep program. The program did an excellent job of preparing my physically and mentally for the rigors of Ranger School. I cycled through it once before our Brigade level Ranger Assessment Program, then cycled through it again before going to RTAC at the WTC in Fort Benning. Thank you for all you all do, and the support you give to the military and law enforcement communities. I would also like to give you all some kudos. I graduated Ranger School on Friday (17OCT) and was able to make it through without any recycles. A large part of that I think is due to my training leading up to Ranger using your Ranger School Prep program. The program did an excellent job of preparing my physically and mentally for the rigors of Ranger School. I cycled through it once before our Brigade level Ranger Assessment Program, then cycled through it again before going to RTAC at the WTC in Fort Benning. I would recommend that you somehow incorporate more flutterkicks into the workouts as they seemed particularly fond of them in Darby Phase. Also, for those of us who are time-constrained, if push comes to shove between a workout and a ruck march on the plan, always pick the ruck march. During Ranger School you spend so much time under a ruck that rucking will serve you best instead of lifting weights. For the rucks in the plan, since you have two per week, I would recommend having one be for time (i.e. to prep for the 12 miler that weighs about 50lbs) and then one that is for distance and at a heavier weight (i.e. 60-80lbs). After RAP week, I can’t think of a time when we rucked with anything less than 60lbs (maybe through Darby if you didn’t carry any squad equipment).